Since Natalie has started fifth grade, there have been a lot of lasts. 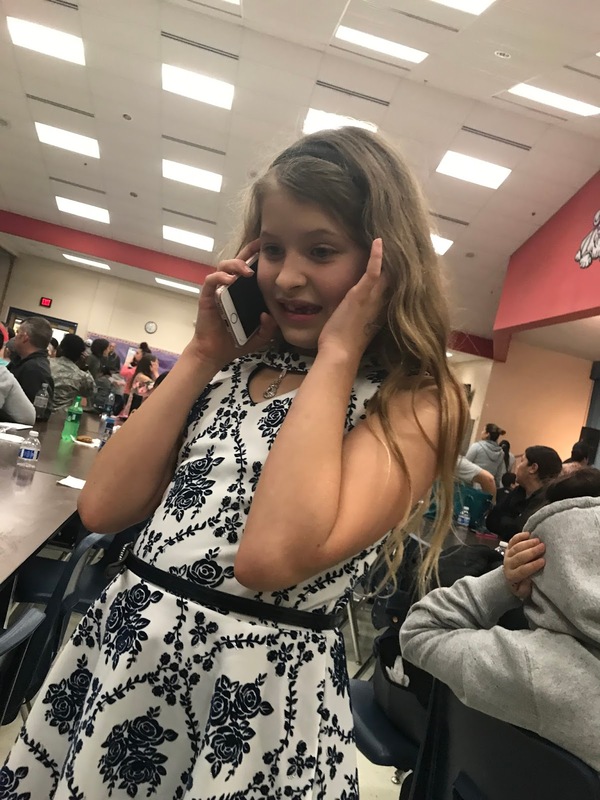 Her last elementary Christmas party. Her last elementary school dance. Oh sure, there will be other dances in middle school, but still. Will it be as innocent? Probably not. This dance had the entire school. PreK all the way up to fifth grade. Will it change her for the worst? Or for the better? I hope for the better. I can see little snippets of Natalie growing up. For starters, she insisted on a heeled shoe even though they were slightly big on her. "But I feel so tall," she marveled. So she wore the shoes. There was no date, but she did tell me a few boys asked her to go to the dance. Nothing serious though, in once instance a boy came over to her and asked if she'd go with his friend. Natalie said no, she'd rather be "single like a Pringle." It's starting. The boy thing. Natalie has taken notice a few and some have taken notice of her. But it's still sweet and mostly them chasing each other around the playground at recess. In Middle School there is no recess. The dance was held in the gym, and I settled down with a book and a Diet Coke while Natalie rushed to her friends. They squealed. They did that high pitched girl noise as they gripped each other's arms and cooed how wonderful each other looked. "I like your heels," I heard one girl tell Natalie, who immediately spun. 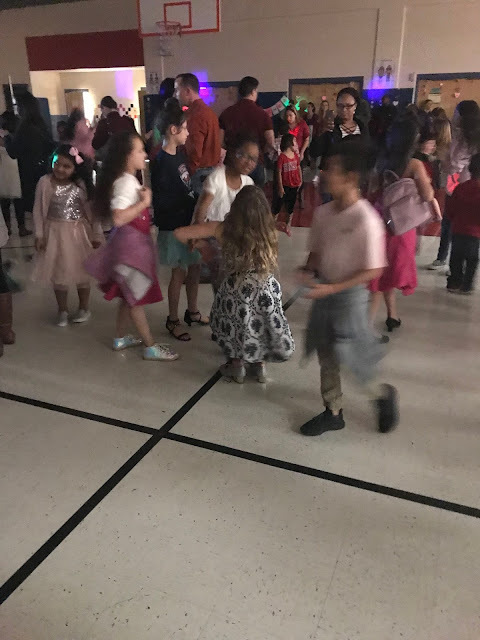 The dance floor became crowded with kids from various ages. I would check on Natalie now and again. She'd spot me taking photos or a friend of hers would. "Natalie! It's your Mom!" a friend would shriek, and they'd duck away. I still caught Natalie "dropping it like it's hot." At one point she came over to me on the phone. It wasn't her phone either. "Who are you talking to?" I asked. Natalie held up a finger. "Uh huh. Uh huh. Girl, we're here waiting on you. Well tell your Mom you need to come. Uh huh. Okay. Bye." She hung up. "What on earth?" I wondered. "That was my friend. We were wondering where she was but her Mom says she can't come. Something about wanting to relax and watch Grey's Anatomy." Natalie gave me a hug. "Well, I'm off to dance! Bye!" And she clomped away in her heels. I'm glad she still hugs me in public. Will that change in Middle School? The dance was a success. It was only from 5-7, because, you know, the tiny kids have to go to bed and all. Natalie said she did dance with a boy "but only for like two seconds" but that she mainly danced with her friends. "My feet hurt," Natalie said, taking off her shoes and rubbing them when we got into the car. "Welcome to being a girl. Although honestly, I wear flats now. I can't do heels anymore." Natalie laughed. "I'll do heels. I like how tall I feel. Even if they do hurt me." "I'll do flats. I like that I can walk without falling over." So that was it. 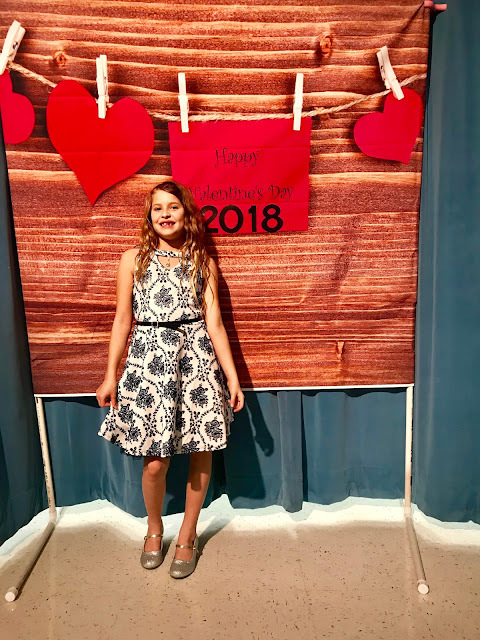 Her last elementary school dance. The next one will be a Middle School dance. And I can only hope that it also ends in laughter. I love this!!! She look so pretty for the dance! Awww, that is fun. There are no school dances here until High School. Even where I grew up, nothing in elementary school - they didn't start until 7th grade (Jr. High). She looks beautiful! Her shoes are adorable! I wore heels for years and I've been gravitating more towards flats lately. 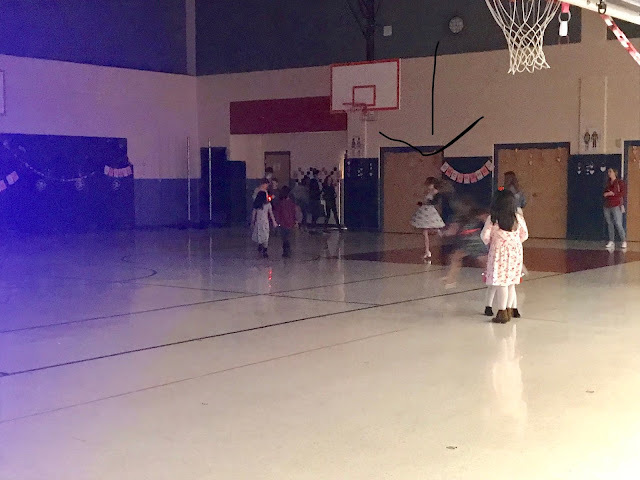 I love that the dance was from 5-7. So cute! Don't blink, they grow up so fast. She looks terrific. I did want to wear heels when I was younger but was already taller than most so my Mom didn't think it was a good idea. We only had dances starting in middle school! Sounds like fun though. There will be more changes but the best part about being a mom is that she'll always be your baby girl. I'm sure she'll bring you along for the ride, she's a sweet and loving girl. I loved her look and her shoes are pretty! It's very sweet that you got to be there for her last middle school dance! I love the heels she wore too. The kids dancing looks really cute and you can see how they enjoy and have fun. They grow up to fast and before you know it, they become grown ups going to parties. Kids grown up so fast nowadays, you have to cherished every moment with them. Love her shoes as cute as your daughter. I hope she had a great time on the school dance. Girls usually continue to hug unlike boys. Our elementary school never started dances until middle school. Great she has the opportunity to attend and have fun. Look at your little girl with her first high-heeled shoe! They really do grow up so fast... as cliche as that may sound. But she seems happy and healthy, which is absolutely the most important. awww.. 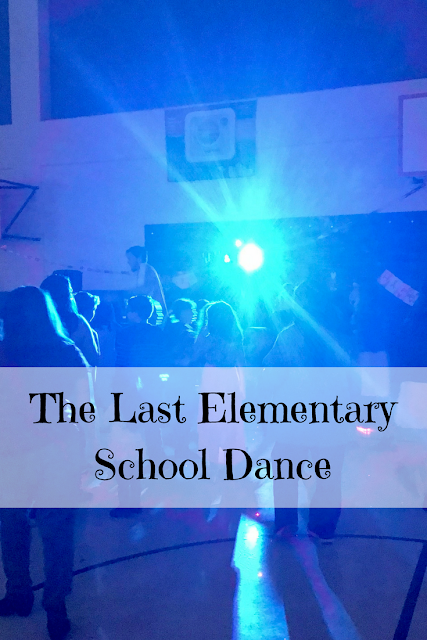 I remember my last elementary school dance!! They had contests and we won and won a RECORD of Bon Jovi. Chew on that for size. It was 1990! I really like "single like a pringle." I'm reading Wonder right now and they call 5th grade middle school. That blows my mind! 6th grade is middle school, people! Aww it sounds like she had such a lovely dance, it must be wonderful, yet slightly sad seeing her grow up and going through these lasts. But oh the firsts as well! What a bittersweet moment. She seems like a fun, sweet girl so I'm sure she'll continue to make you proud even when she gets into those teen years. She looks beautiful! What an exciting and fun moment. I'm sure bittersweet too. I'm sure middle school dances are just as fun. I am a retired 5th grade teacher. This post made me miss my kids. She looks lovely and sweet and happy and energetic! Your daughter sure looks grown up in that dress! I am happy she enjoyed her last elementary school dance. That must have been a really memorable event for her. I had the same thoughts as you when my daughter was the same age. Well, everything turned out fine, and in a blink of an eye, we were watching her leave with her date to attend their Seniors Ball. 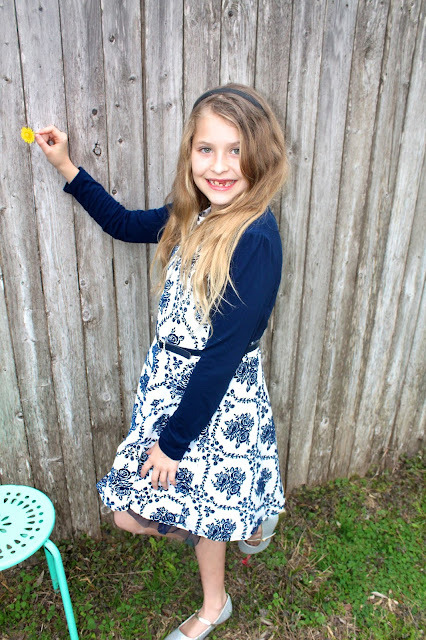 What a pretty dress! I feel like I missed out because I didnot have a school dance! not even in high school! It goes by so fast! I don't have kids but I see how my students grow up and move up. I'm sure there'll be a lot more firsts. I love how she looked for the dance, so beautiful! Awww your daughter is so adorable. It's amazing how quickly time flies. My older one just started elementary this year. She looks really cute. I have similar feelings, my son is headed to HS. I’m thankful that middle school has been a great place for him to grow. We don't have a middle school in my country and our elementary is until 6th grade. Well, Natalie's last dance in elementary sure sounds a memorable one. Kids these days grow so fast! This reminds me so much of my eldest daughter who's now currently in college. We've reached so many milestones that made me laugh, smile, cry and love her more than I ever could. I think your daughter looked pretty for the dance! Such a great and memorable last dance for your little girl. Time flies so fast and enjoy each and every moment with her while she is young. Another chapter of her school life is yet to begin. Time flies so fast. I've never had kids but I've had nieces and nephews whom I watched grow up. It's never easy, I guess it's all about savoring the moment with them. The sweet and innnocent phase seems to get over quiet fast. Do enjoy it while it lasts. It is something that does not come back. Of course that does not mean that the next phase is not good, but the charm of the elementary school years is totally different. Can't help myself but wonder about how my kids would change too, from innocent to someone more complex. Aww, I'm in tears. Maybe it's normal for us parents to worry or reflect if we did parenting good enough to raise them well. I think, with all the decisions she may have to do, she'll always remember to be a good person because of you. Oh she is growing so quickly! I am glad she is ready for the next step though. This brought so many memories to my mind. I have two daughters. One in HS and the other in MS. Loving this post. You’re daughter is precious. Enjoy each stage of her life. How fun! She looked so pretty, nice shoes! I use to love dances when I was a child. My son only had dances starting in middle school! Sounds like she had a lot of fun! Omg she looks so cute! My little sister just started 6th grade this year so cherish her last everything in elementary school! I alwaal lovs to read about Natalie's news. She has grown into such a lovely kid! I couldn't help myself from smiling when Natalie said that she would rather be 'single like a pringle' as I use that catchphrase myself. Her humor really reminds me of you, you always make me laugh. But on another note I love that she is now wearing heeled shoes she looks adorable! Your daughter looks beautiful. I have a mixed feelings about these early school dances. Maybe I am old fashioned, but I don't like how it is encourages kids to pair up so young.